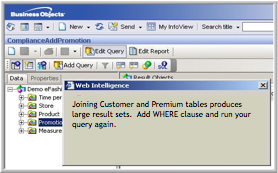 Unpredictable user behavior, complex query patterns, inefficient applications, huge (and getting bigger) databases. These and other factors make it really challenging to maintain the optimization, performance, and business value of dynamic, data-intensive applications like business intelligence (BI), analytics, data warehousing and big data environments. Teleran’s Visibility and Performance software delivers comprehensive visibility and real-time management of user behavior, application activity, and database usage. Our patented database security solution provides a complete and automated management model that monitors, analyzes, alerts and acts to ensure your business-critical database applications deliver the performance and business value your users expect. Unlike conventional system monitors and database utilities, Teleran’s patented visibility and performance software solution delivers a comprehensive and unified view of business users, applications and data activity, allowing you to anticipate and deliver what the really business needs. Because usage in these environments is constantly changing, Teleran’s solution captures a continuous view of activity so you always have the entire picture of what’s going on. Teleran’s 360 degree visibility ensures that all user behaviors and processes are tracked and analyzed to identify the conditions and activity that need to be modified or prevented. Data warehouse performance and service begins with the users: understanding them, tracking and analyzing their interactions with the applications and the data. 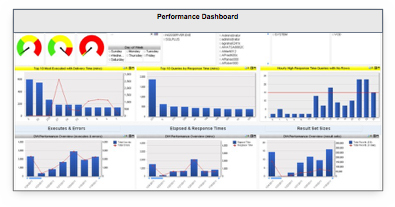 Teleran’s out-of-the-box visibility and performance analytics deliver the right dashboards, alerts, reports and analyses to quickly pinpoint and resolve user, application and database issues. No matter how much planning goes into your data warehouse and Big Data environments, application users inevitably issue inappropriate or “runaway” queries that degrade performance, deliver inaccurate results, or violate governance policies. Teleran’s solution prevents inappropriate queries from reaching the database and reducing service levels, wasting resources or generating errors. At the same time, it sends intelligent messages to BI users guiding them to more efficiently and effectively interact with the data warehouse. When it comes to business-critical applications, you can no longer risk long and expensive implementation cycles. Teleran’s Visibility and Performance solution automates installation and configuration processes for rapid deployment. This enables you to deliver fast time-to-value at a reasonable cost. Licensing models include software subscriptions, perpetual licensing, SaaS, and managed data security and compliance services.